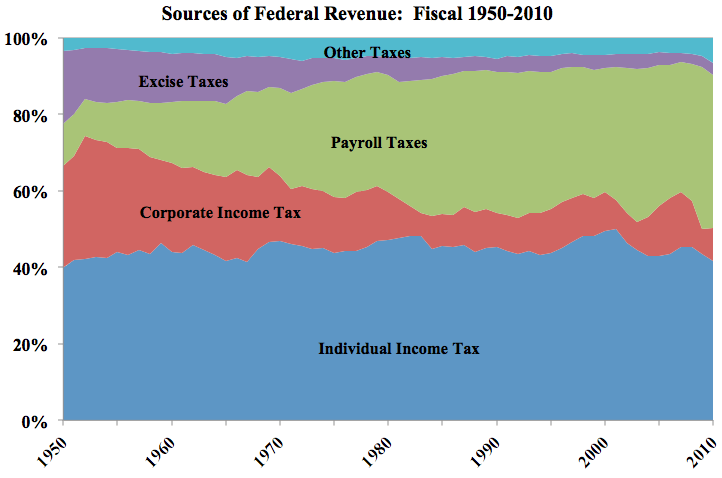 In the 1950s, nearly one-third of federal revenue was from corporate income taxes. In 2010, corporate incomes taxes dropped to less than 10% of federal revenue. Remember, many Republicans say the corporate tax rate is too high, making it difficult for American corporations to complete globally. The corporate tax rate is 35%, and that does rank high compared to other countries. But it’s the effective tax rate that matters. Last year the effective corporate tax rate dropped to less than half the statutory rate. Way less in fact. Last year ThinkProgress reported that the effective rate had dropped to just 12.1%. During this same 50 year period, the amount of revenue from individual income taxes remained relatively flat at around 40%. Also during this period, payroll taxes skyrocketed from a little over 10% to around 40%. While companies do pay half the payroll tax, it still represents an increased burden on individuals. It seems like every few days or weeks we hear about record quarterly profits by some of America’s biggest companies. As you can see from the chart above, these same companies are paying a much smaller percentage of their profits in taxes compared to 50 years ago. And Republicans want corporate taxes to decrease further, saying reduced taxes are the only way to grow the economy. — Unbelievable. You know, I wasn’t alive at the time, but I do recall from history books that the economy did pretty well during the 1950s. And that’s with 40% of federal revenue coming from corporate income taxes. Do you think we can at least split the difference? Last time I checked, this country’s infrastructure was in desperate need of repair and modernizing. I say raise those corporate taxes and spend money on projects that benefit the entire country. It will create jobs now, and the improved infrastructure will spur economic growth in the future. Explain to me how Republicans are correct. Explain to me why we should listen to them. It’s greed, plain and simple. How else do we explain Republican intransigence on taxes? Their logic does not comport with the facts.